I have a strong affection for older Asian women, I think it is because they remind me of my grandmother and all the aunties during the holidays. They would sit around the table playing majong, sucking the air through their teeth as someone played a good hand and gently poking fun at each other. Even when you hear them grumbling about their husbands or their arthritis there is a certain good-natured spirit that is palpable. With the passing of my grandparents we don't see the extended family nearly as much. They've grown older and traveling takes its toll but mostly my grandparents were the anchor of the family. It was because of then that we stayed together, through their sheer strength of will. They're greatly missed. 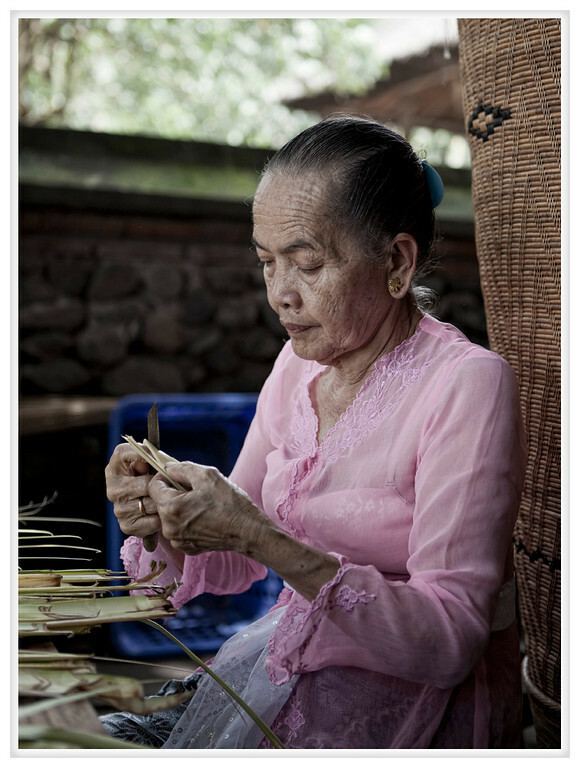 This photo was taken at Tenganan Village in Bali and the woman pictured was making baskets into which they would place the elements of their offerings to the Hindu gods.